Mophead Productions presents, THE HOUSE OF RAMON IGLESIA, by Jose Rivera, at the Old Fitz Theatre, Cnr Cathedral and Dowling St, Woolloomooloo, May 12 - June 6. Director Anthony Skuse and Mophead Productions introduced this writer, Jose Rivera, in 2009, when he gave us REFERENCES TO SALVADOR DALI MAKE ME HOT (2000), at the Griffin. THE HOUSE OF RAMON IGLESIA (1983) is Mr Rivera's first play and has all the hallmarks of an auto-biographical/poetic licensed work. Javier (Stephen Multari) is the eldest son of three brothers, the others: Julio (Christian Charisiou) and Charlie (David Soncin), of Pureto Rican parents, Ramon (Nicholas Papademetriou) and Dolores (Deborah Galanos), who have emigrated to Holbrook, Long Island, in the United States. Javier has found the new country bountiful and an opportunity for change, and except for Julio who has joined the army, the other family members have lingerings for the old country. The tensions of old culture vying with new culture, and the cultural educational 'rubbings' within the family politics are the subject matter of the play. It is a family drama and has all the trappings of that genre: quarrels, laughter and tears with the added ingredient, here, of a volatile and, relatively, exotic temperament. The play has a fairly familiar structure and concern, but it is a well observed and written work - there is much to feel safe with and enjoy (one wishes that there were as many creditable first plays from our young Australian writers as this!). Working with such a superior text, Mr Skuse has found his deft hand again, after the recent less certain work with PLATONOV and CARESS/ACHE, and has guided his company of actors into a robust and exciting set of performances that sweep one up and into the world of the play. One became quite emotionally involved/lost in the world of the play and the dilemmas of the people. At 110 minutes without interval it is a slight physical challenge. Mr Papademetriou and Ms Galanos create a rich world with their tasks, and are supported by Mr Multari, Charisiou and Soncin in three beautifully demarcated performances as the sons. 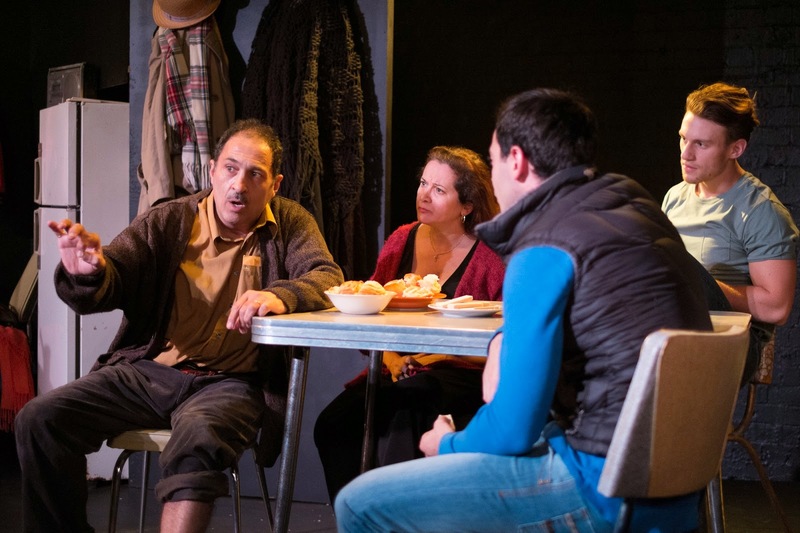 Add the commitment and skill of Eloise Snape, as the American girlfriend, with a 'golden heart', Caroline, and the local land-developer, Nick Calla, played by Ronny Jon Paul Mouawad, and a dynamic ensemble of storytellers display passion, humour and pathos. The Design, by Georgia Hopkins, on a raised platform stage is stripped to the necessary, and with Mr Skuse, has solved elegantly, fluidly, the choreography to shift the locations, visibly, as part of the forward energy of the work. Chris Page, with his Lighting Design, manages to create true scenic atmospheres. This is, further, assisted by a particularly rousing and apt selection of music by Sound Designer, Alistair Wallace, that keeps the cultural rhythms of the family background pulsing throughout. All in all, THE HOUSE OF RAMON IGLESIA is a more than pleasant time in the theatre, and for those of us looking for a good story, well told, and well acted by a very rewarding set of artists, you can be assured of value and satisfaction. The Independent Theatre scene seems to understand what an audience might want as part of its diet (for tougher stuff check out, SHIVERED). And, as the Sydney Theatre Company (STC) has virtually closed down its public performances until after the Writer's Festival, for a week or so, (I imagine, though, that the administration is still at work, paid work - poor artists, indeed), and then, with just one production, BATTLE OF WATERLOO, in the month of June, 1st - 27th June (three weeks only with 7 actors), THE HOUSE OF RAMON IGLESIA, at the Old Fitz Theatre, curated by Red Line Productions, is more than a viable choice to search out. What is this with the STC virtually on a SEVEN week 'holiday" mid-year? Seems odd, does it not, that the major subsidised theatre company in Sydney has only one work to show for THREE of SEVEN weeks? Did this happen last year, too? Weird, don't you think? The production worked particularly well in the early scenes, where the cast brought family teasing and sparring to vigorous life. Everyone seemed on the move in the cramped space, fighting to hold on to his or her priorities and worldview. I felt particular admiration for Deborah Galanos, who in her first moment and movements alone on stage created a compelling portrait of a soul locked in grief. The boisterous energy of her sons soon disturbs but does not alter our deep impression of her. As her soon with his destiny as a Marine energising his slightest move, Christian Charisiou arrives as if an émigré from Scorseseland, and nothing he does thenceforth feels out of place. As you say Kevin, the contributions of director Anthony Skuse and of the designers have served this terrific play well. Nothing felt forced or obtrusive. I look forward to seeing more from all involved. A production team needs to always work cohesively in order to produce a great show that will attract a welcoming response. I bet the house of ramon iglesia would be able to do just that for their audiences.